On behalf of all the Middlebury First Responders (MFR) board members, thank you very much for the support in funding our first MFR Appreciation Banquet. We are all incredibly satisfied with how the event turned out and have received wonderful responses from both the community members and the students who attended. In attendance were around 30 students, including first responders and their guests, 13 community members from Middlebury Regional EMS, and 10 from Middlebury Fire. 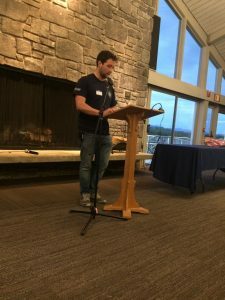 The event lasted around an hour and a half and included mingling, a dessert buffet, an introduction to MFR, and an awards ceremony honoring members of each agency and a student who have played particularly important roles in maintaining the connection between the students and the agencies. We were also able to honor the late Ed Sullivan by dedicating one of the awards in his name as a way to appreciate his commitment to establishing valued and long-lasting relationships with his students. 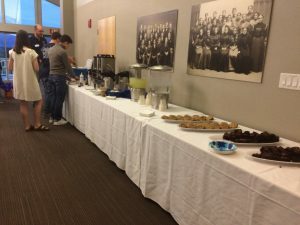 The money from the Service Cluster Board Flex Fund Award primarily went towards the dessert buffet. The rest of the award was used for various supplies such as plates/utensils, nametags, and flower bouquets for those who were honored during the event. A few members of MFR gathered prior to the banquet as well to bake the cookies and brownies and to help assemble the decorations. This allowed for some fun bonding leading up to the event, which was valuable, considering how new we are as a student organization. 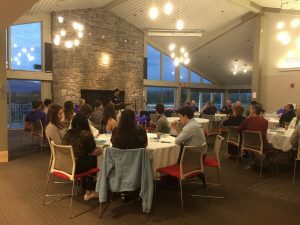 All in all, the banquet was an excellent way to kick off MFR and has left the board members confident going into next year that this student organization will be meaningful and helpful to students and local community members alike. We look forward to building from this experience next spring, as we hope to make this a yearly tradition to show our continued appreciation to the staff at Middlebury Regional EMS and Middlebury Fire. This entry was posted in Midd Blogosphere and tagged Uncategorized on July 12, 2017 by Rafael Hernandez Cruz.